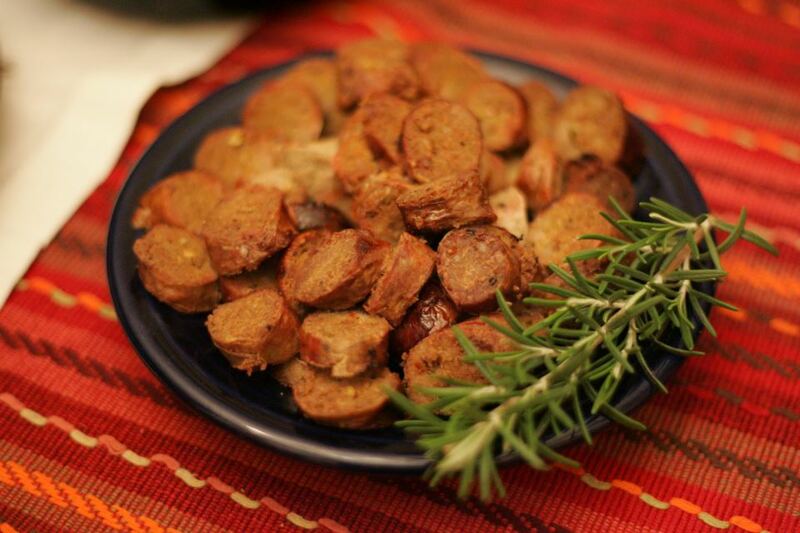 This is a delicious recipe that doesn’t take much prep work. We had a lot of lemons left over from a cocktail party last weekend and I thought this was a good way to use a couple up. My chicken was still partially frozen when I began cooking it so my cooking time will not be your cooking time. Plus these chicken breasts must have come from the adult industry of chickens! Seriously one was about twice the size of a normal one. 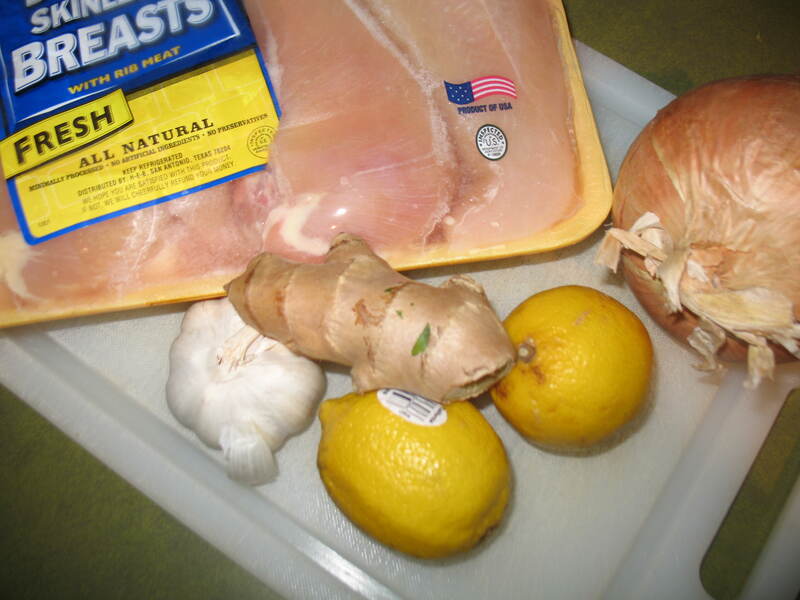 Rub garlic, ginger, and olive oil all over breasts. 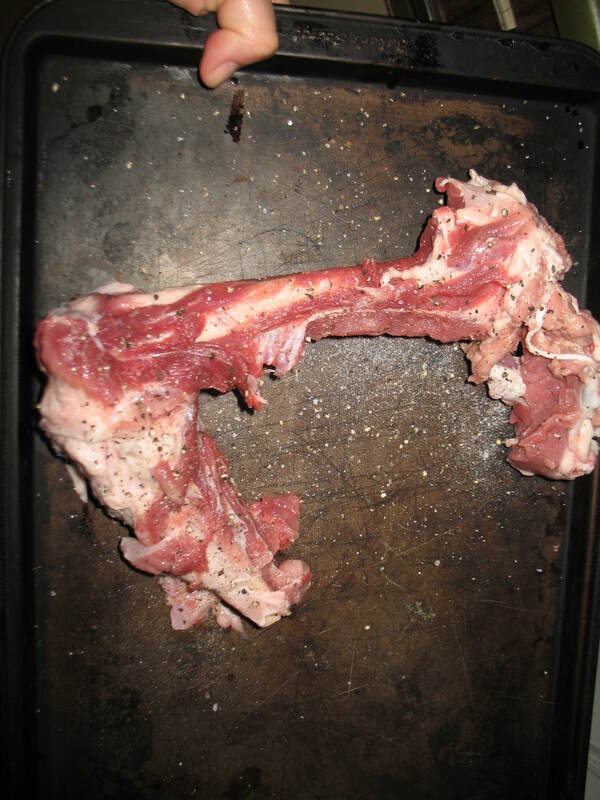 Place breasts in a baking pan. 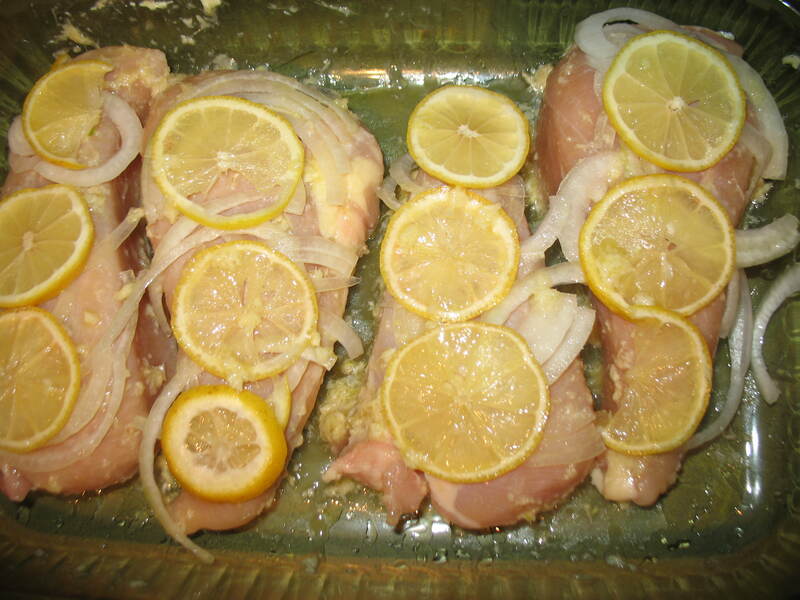 Layer the onions over the chicken breasts, then the lemon slices on top of that. 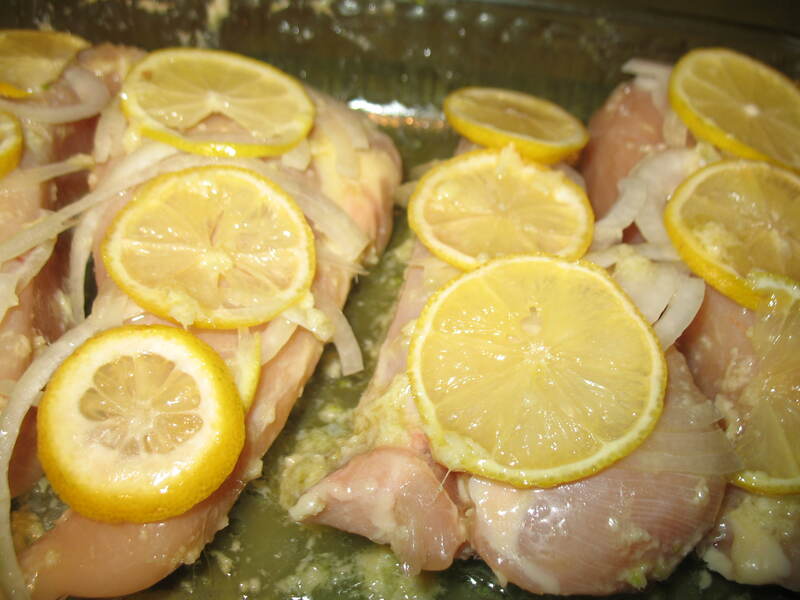 Finish by squeezing the remaining lemon over the dish. Cover with tinfoil and bake for 2 hours at 350. Again mine were slightly frozen and huge. Normal sized, thawed, breasts will take about half that time. 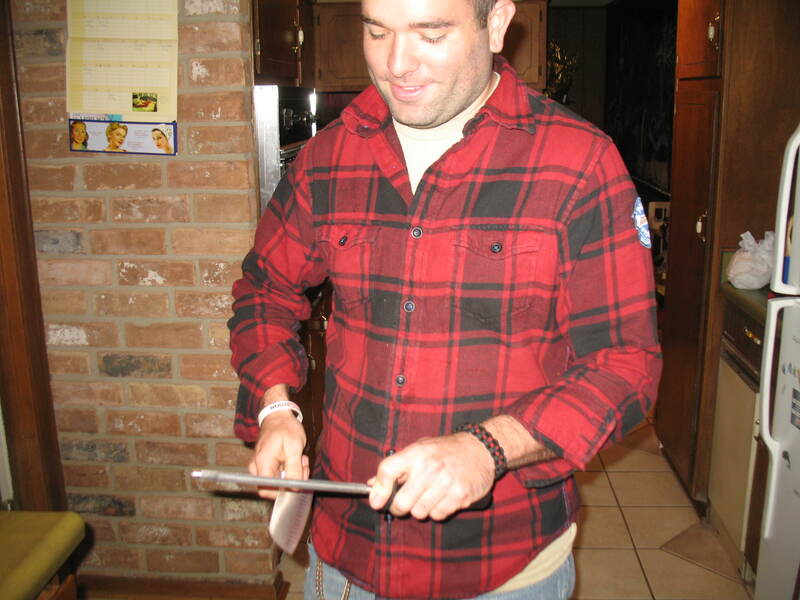 As always check for doneness with a meat thermometer. About ten minutes before you serve dinner pour off the juices that have cooked out into a small sauce pan. Add a tbsp of butter and heat to high heat. While the juices are reducing down, make a roux with flour* and water in a small bowl. You will need about 2 Tbsp of flour to about 4 Tbsp of water. 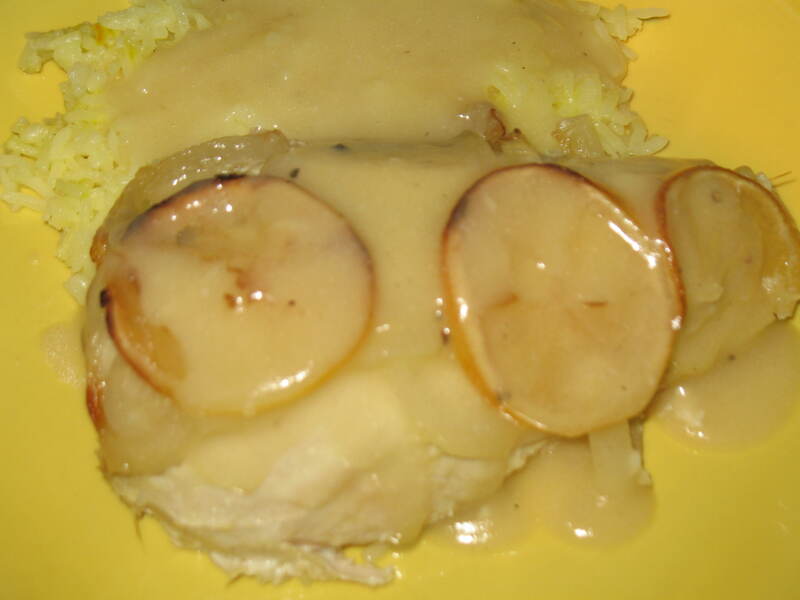 When combined add to the juices to make gravy. We served this over saffron rice*. It was a beautiful bright dish with bright flavors. *The addition of flour and rice are not paleo. If you wanted to make it paleo make cauliflower rice and use xantham gum as a thickener instead of flour. My dear friend Brittany just started her first paleo blog. She is awesome, beautiful, and makes the tastiest food. Please check out her blog. 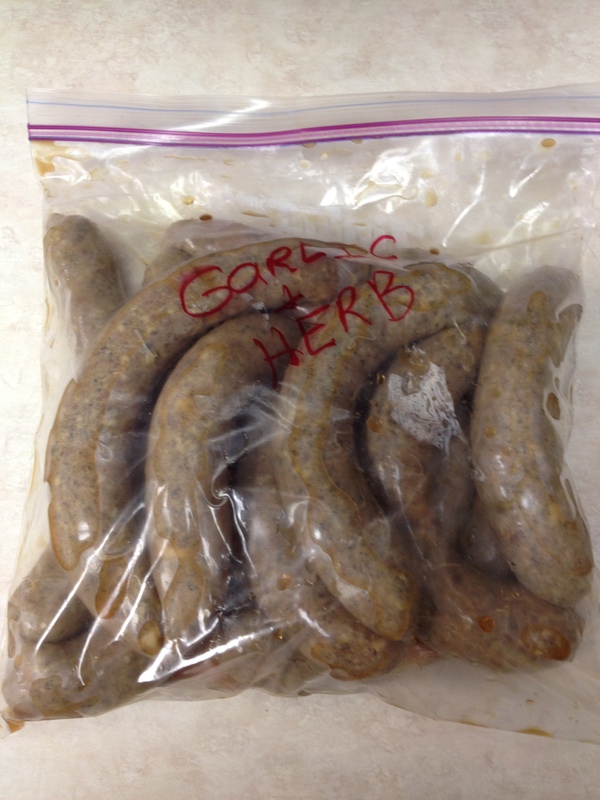 These are pictures of one kind of sausage we made last Sunday. They are not perfectly stuffed, but it was a first time attempt. 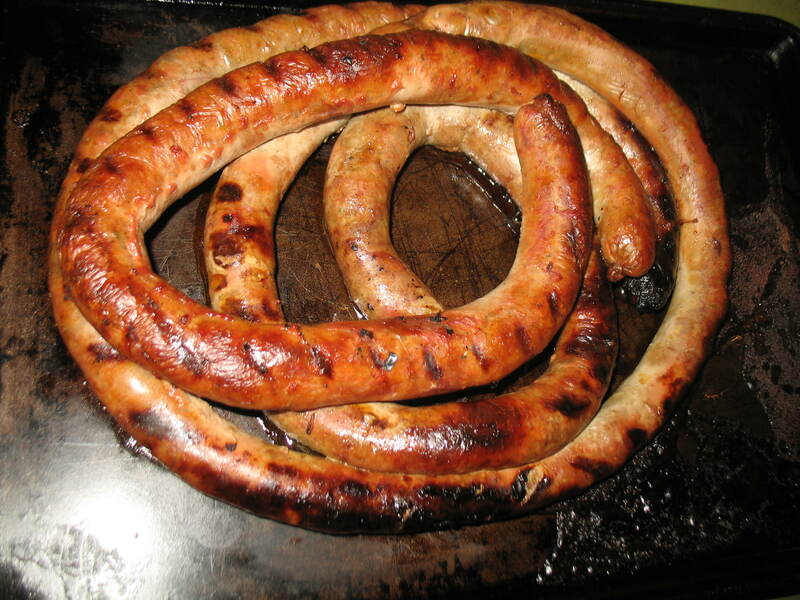 I grilled the entire length of the sausages and then cut off what we wanted to eat. This was our spicy kind. 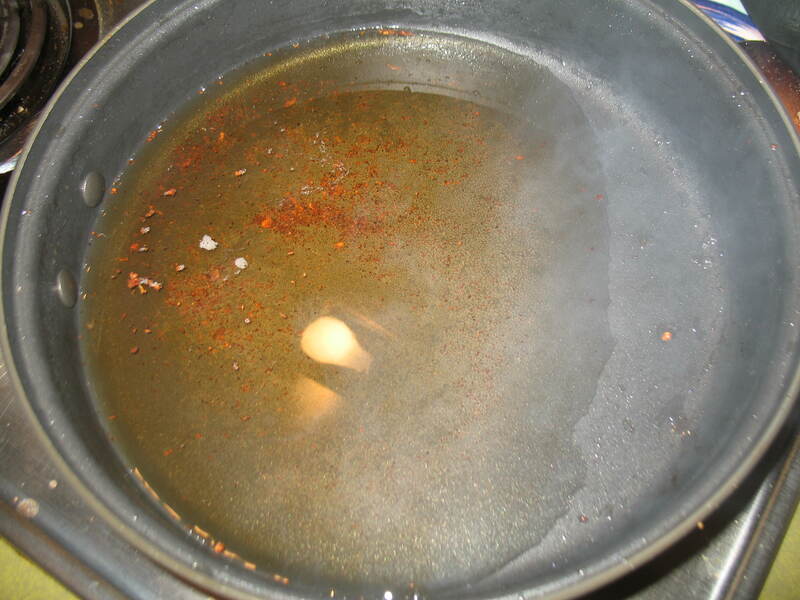 We used some red pepper, fresh jalapenos, and other seasonings. We didn’t write down what we used because we made 5 different kinds that day, and we were pretty much elbow deep in meat. This picture was taken by my friend Lorenzo de Scgt at our cocktail party. He is an amazing photographer! These were very tasty and got eaten quick. 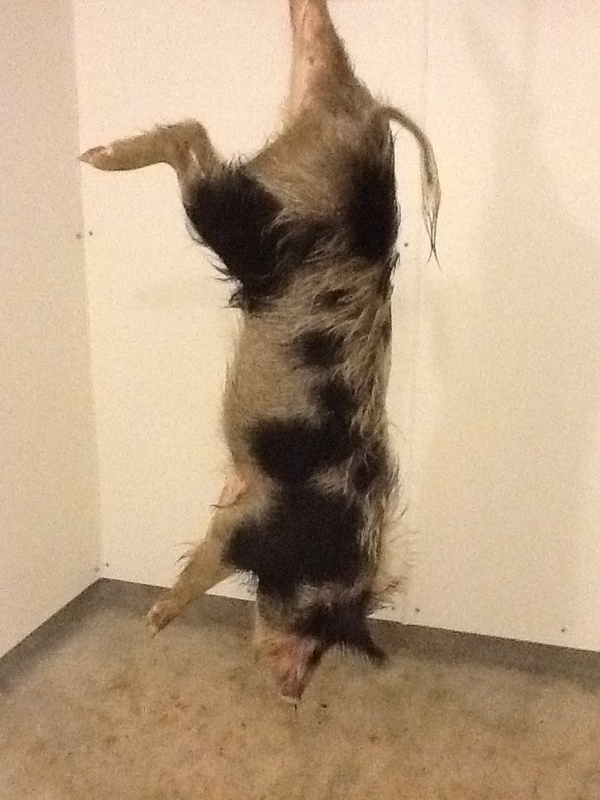 My friend Ryan Called me last week and told me he caught a hog and wanted to know if I’d be interested in helping him butcher it. I was so excited! I spent the whole morning of watching videos on how to do this. These videos are amazing and offers great tips. 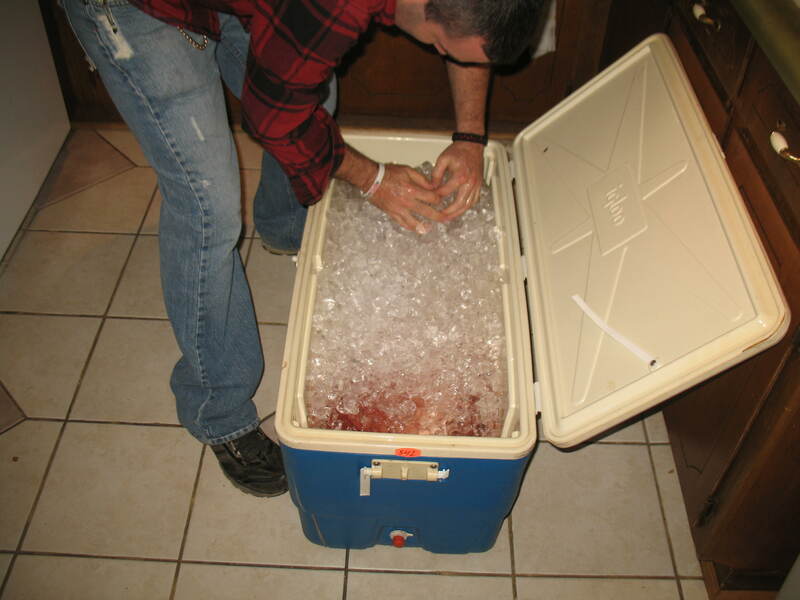 The hog was on ice and already skinned and quartered when he came over so a lot of the hard stuff was already done. But, I still learned a lot and made an enormous mess in the process. These are some pictures of our afternoon of grinding, cutting, and trimming. 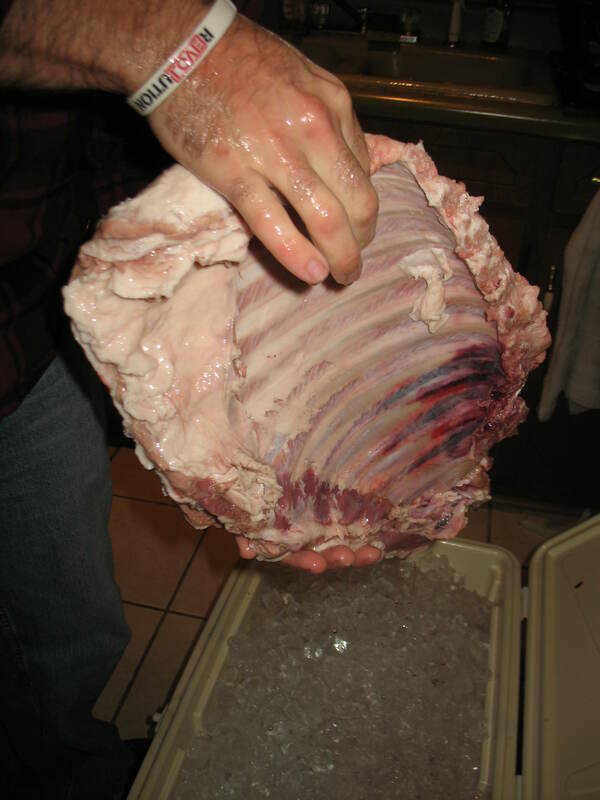 Pulling a full rack of ribs from the chest. The dark part is near where the hog was shot which resulted in some bruising. 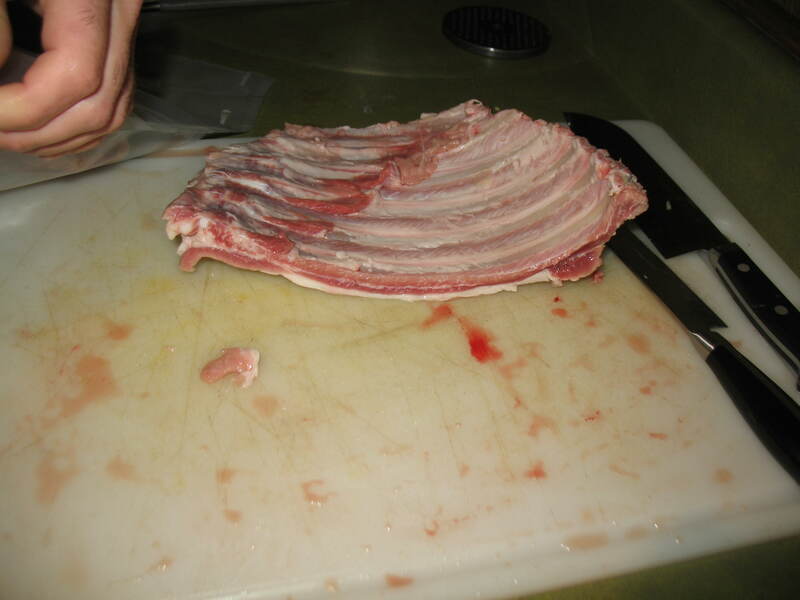 These are the ribs after trimming and cutting smaller so they’ll fit into vacuum seal bags. A femur bone that I roasted for stock later. 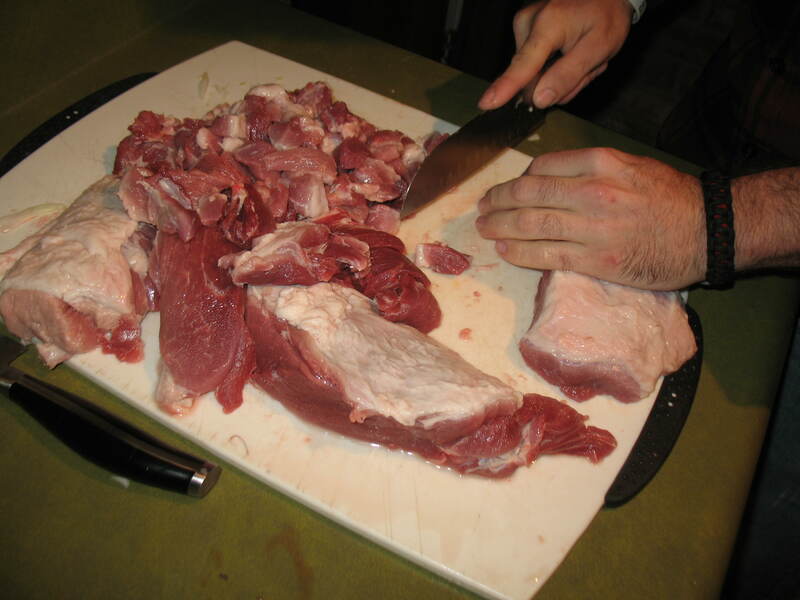 This is a shoulder roast that we trimmed and cut up into small pieces for sausage. We made a ton of sausage. The endless run of sausage. This was before we attached it to the counter with clamps. It is a hand cranking one that really needs to be bolted down. In the end I got out my Kitchenaide grinder too. We had so much meat that it was easier this way. The hand grinder with the aforementioned clamps. The I kept the windows open to help keep the kitchen extra cold and we tried to do one-quarter at a time keeping the rest on ice and freezing it when complete to make sure everything stayed at a good temperature. I have to say when we were done it was so nice to just sit by a heater and warm up. We trimmed up some ribs, hams, loins, and a few chunks of meat for stew or whatever. The rest was ground into sausage. We ground a lot of meat this day. 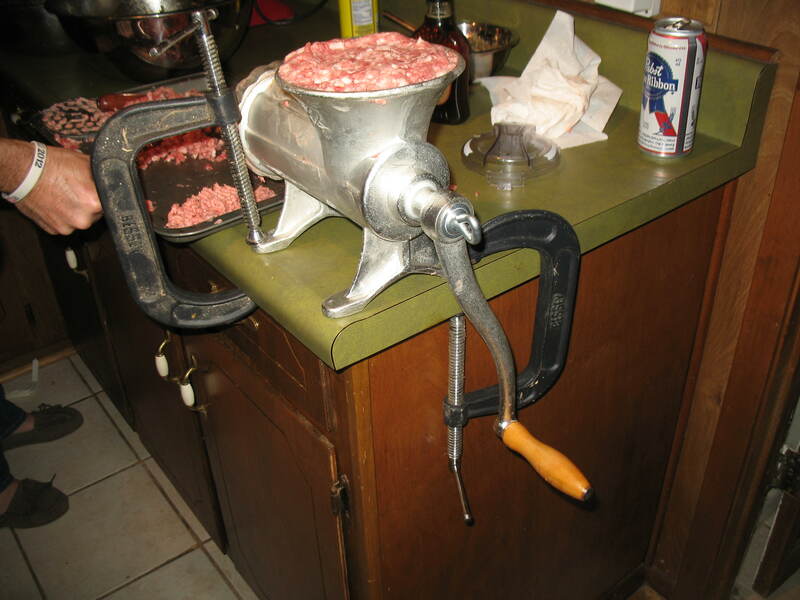 When you grind meat it is best to freeze it first. The fat and connective tissues will gunk up the grinding plates and it will be terribly difficult to do otherwise. 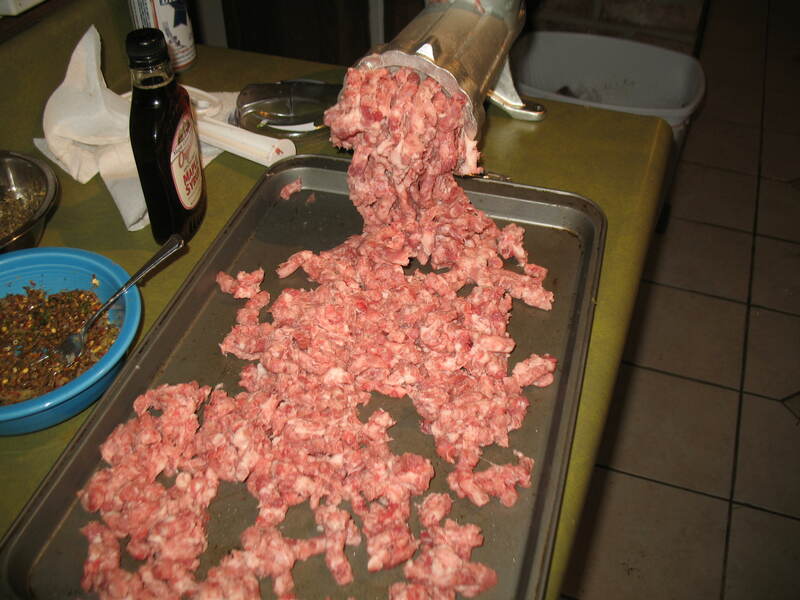 It is also important to save as much fat as you can when trimming to add into the sausage. 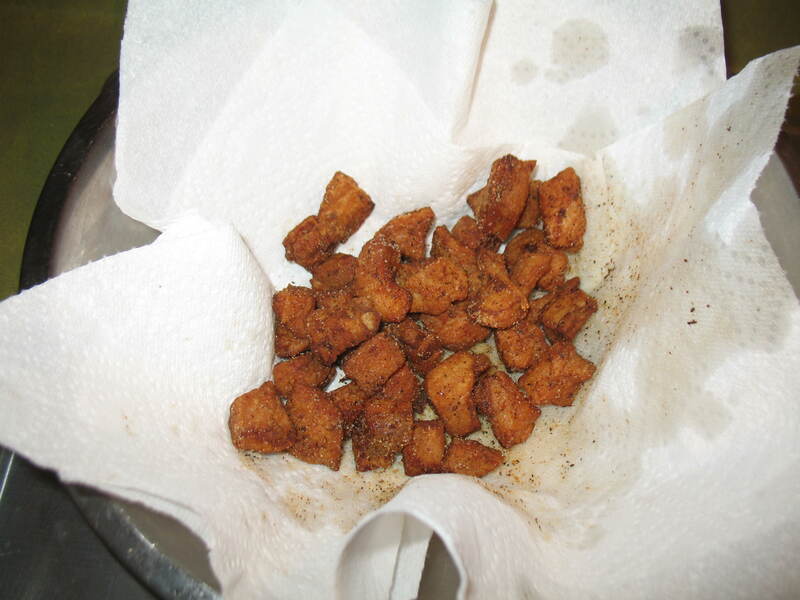 If your hog is very lean you will want to add in some commercial pork fat. 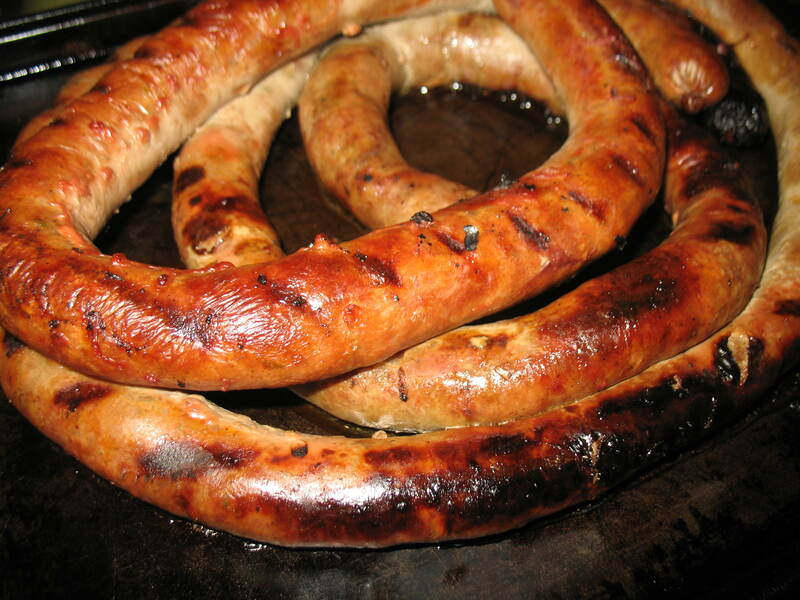 Sausage will taste dry and chalky if you don’t have enough fat in it. We seasoned four different kinds, a maple kind, a spicy kind, a herb garlic, and an Italian. 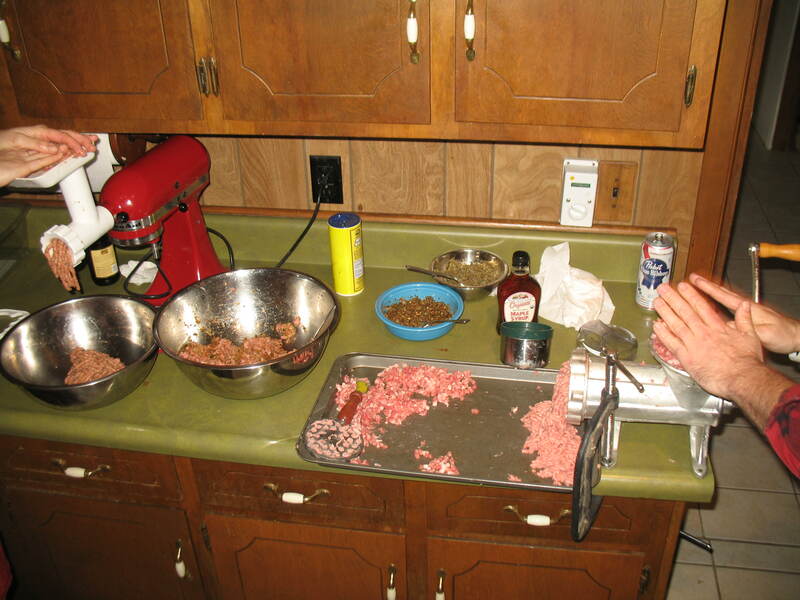 Our method for stuffing the sausage was not ideal so we stopped after one batch and saved the rest for the next day when Ryan had a better stuffer. 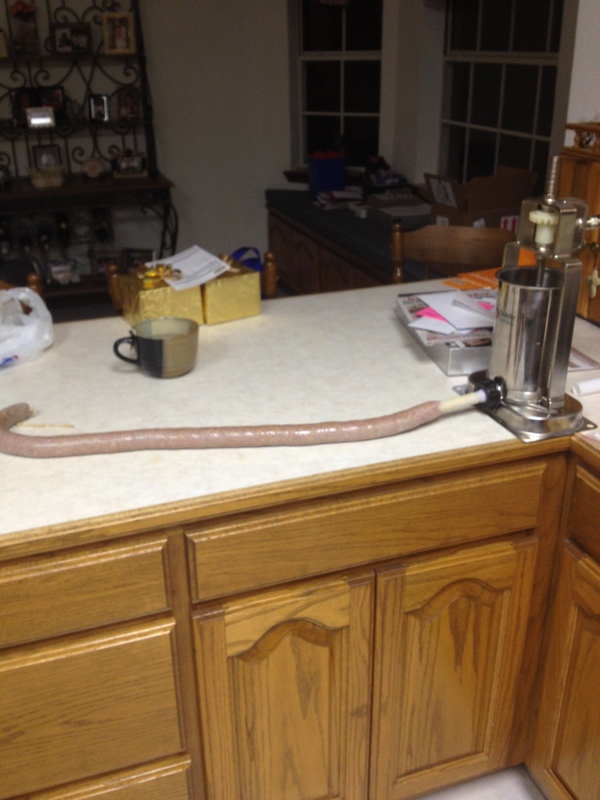 It took us forever to load this sausage but this next picture is from his house and took maybe a minute. Much more efficient. Overall it was a great experience that has inspired me to want to learn how to butcher from beginning to end. If you ever get the chance I recommend you say yes. This is the before shot. Did you know wild pigs were so hairy? I must admit here to you guys, I am addicted to cracklins. I know that acceptance is the first step but I have no desire to recover from this! My friend Sean has shown me the way to homemade cracklin bliss. I used to have to drive 30min to get them now I can make them in my home and get rendered fat as a lovely byproduct. First trim the skin off of your large pork hunk in the freezer. I know you have about three of them there if you buy meat like I do. (when it’s on sale stock up) make sure to keep the fat on it too, this is where you get your fat for frying. 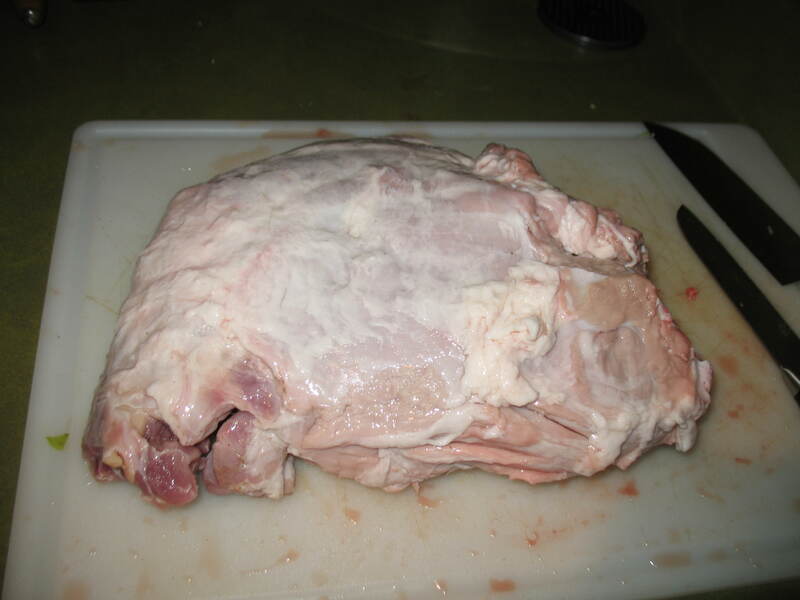 Cut the skin and fat into smaller chunks. 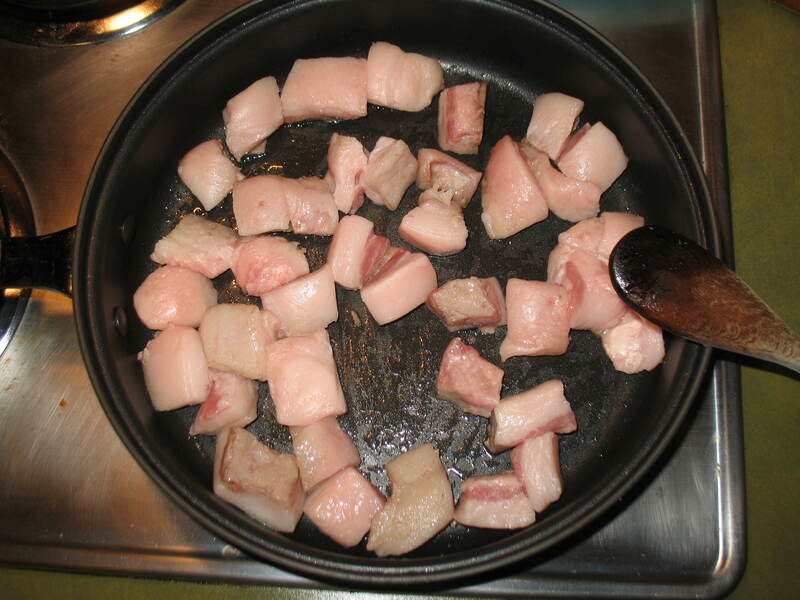 Cook the chunks on low until you have enough rendered fat to fry up the remaining skin pieces. This takes about an hour. I lightly seasoned them before this but the end result was very salty so this may not be a good idea. After an hour turn the heat up and watch the magic happen. The pieces will begin to bubble up a bit. Cook for about 20 minutes stirring and flipping the pieces until all sides are beautiful and crispy. I took mine out and seasoned them a bit early. Next time I’ll try a piece to see if they are crispy enough. I used my favorite Cajun seasoning Slap Ya Momma. But, any Cajun seasoning will do here. They taste like happy magic bacon and ought to be consumed everyday! of course that’s not the best health advice, but then fat fried in fat never is. You will also have a bit of leftover fat. Don’t throw this away. Save it for cooking your eggs and vegetable in. It’s so tasty you’d be sad if you didn’t. Trust me. T sent me a text message today that said “meat puck s= f—-ing amazing”. I think that is as good an endorsement as any for this recipe right here. 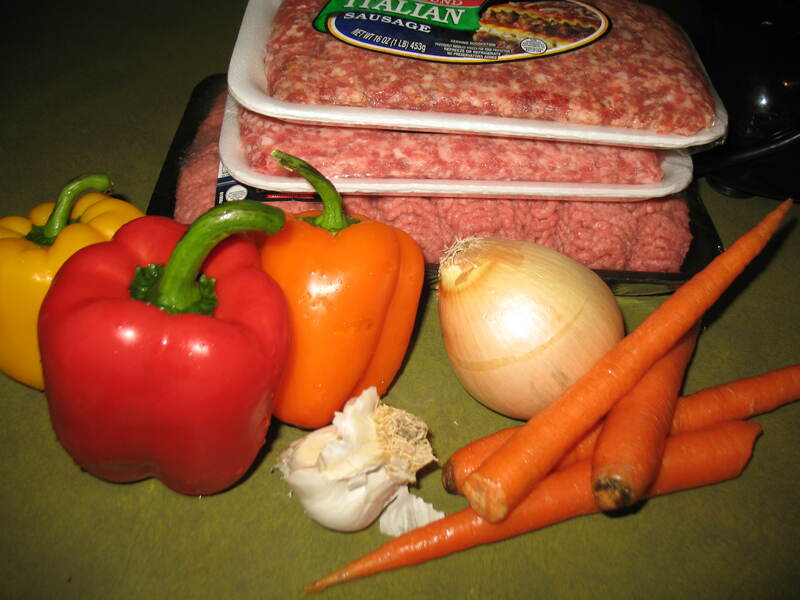 I used a food processor to grind up all the veggies and mixed a few different kinds of meat to make meatloaf. 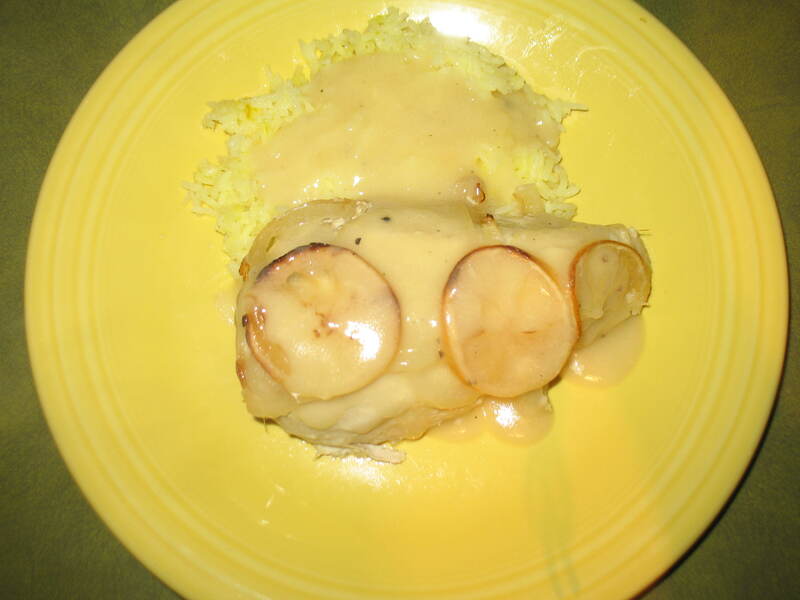 The hands on time is quick and would be a great make ahead meal that you can just pop in the oven when you get home from work. I made one regular loaf and 12 muffin sized (or meat pucks if you prefer). This is a great recipe for those of you keeping paleo and it’s great for kids who don’t like their veggies because there is a bunch in here, but you can’t tell. In a food processor throw all of your veggies and blend. Make sure to trim off stems, seeds, and the skins first. 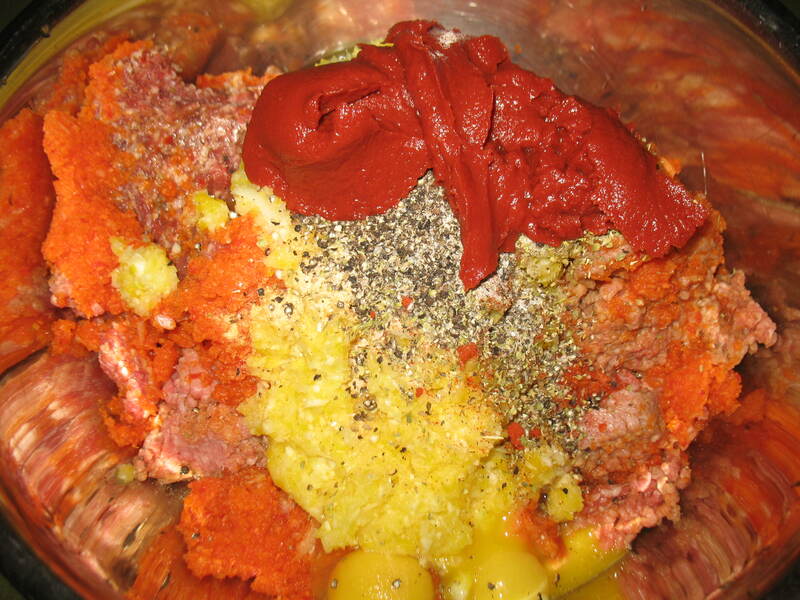 In a large bowl mix the blended veggies with your meats, eggs, paste, and your spices by hand. Transfer the mixture to a greased loaf pan. This will be where the bulk of your meat goes. 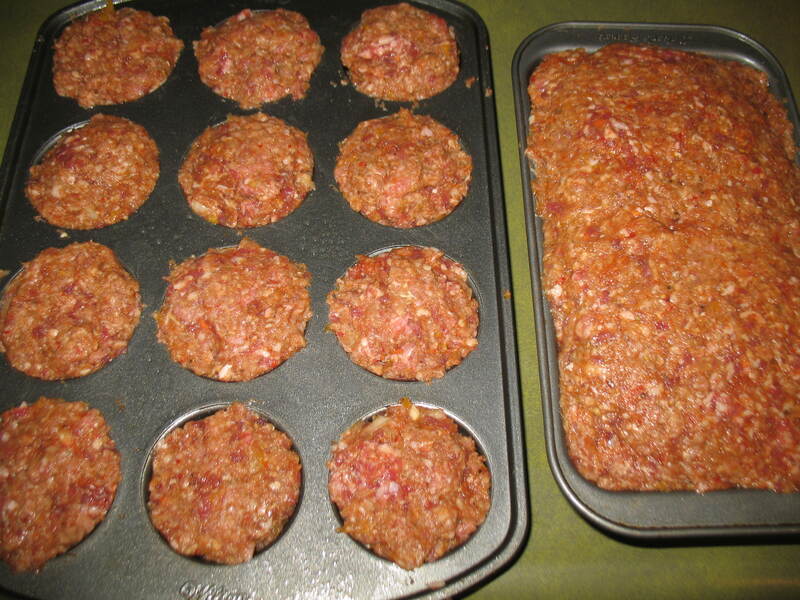 In a muffin pan place the remaining meat. Cook at 400 until cooked through. Times will vary because of the size of each. The muffins/pucks will take about an hour, the loaf about 2. Because there is a lot of vegetables in this recipe make sure to bake on a cookie tray to catch the drippings. I also advise to cover it with tinfoil because it will burn easier. 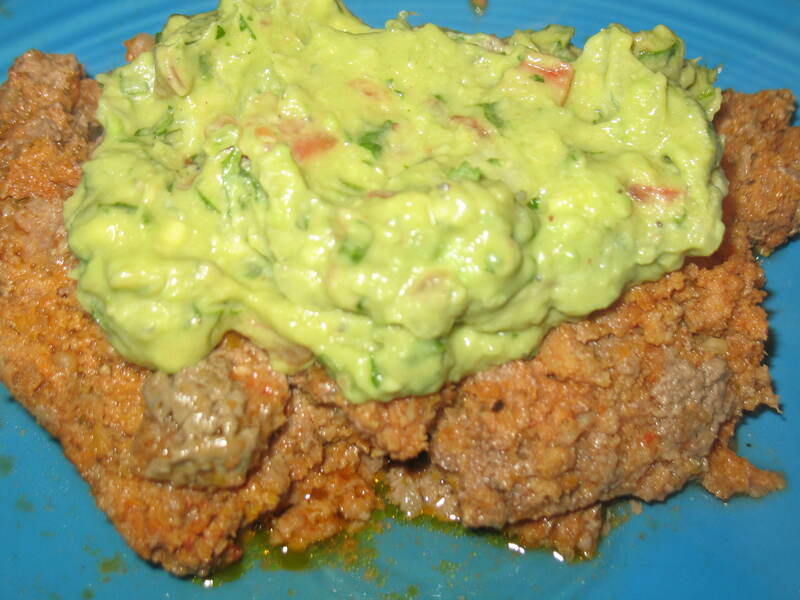 Everything is better with guacamole!